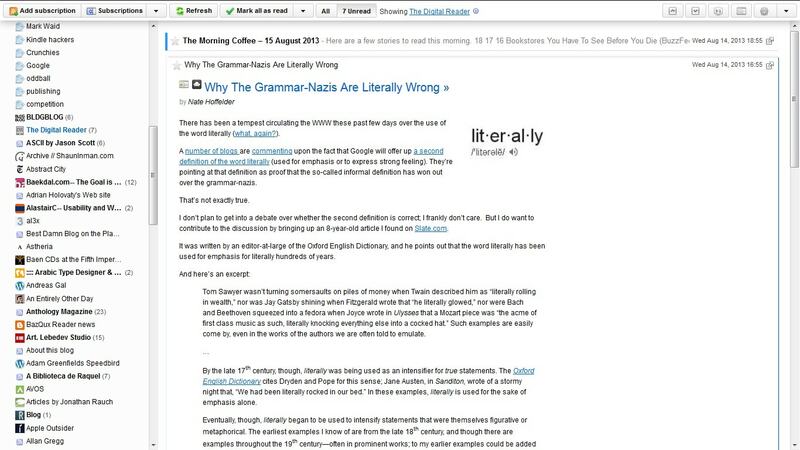 I have tried dozens of possible Google Reader replacements since Google announced the Readerpocalypse in March but rarely have I found one that is so feature rich. 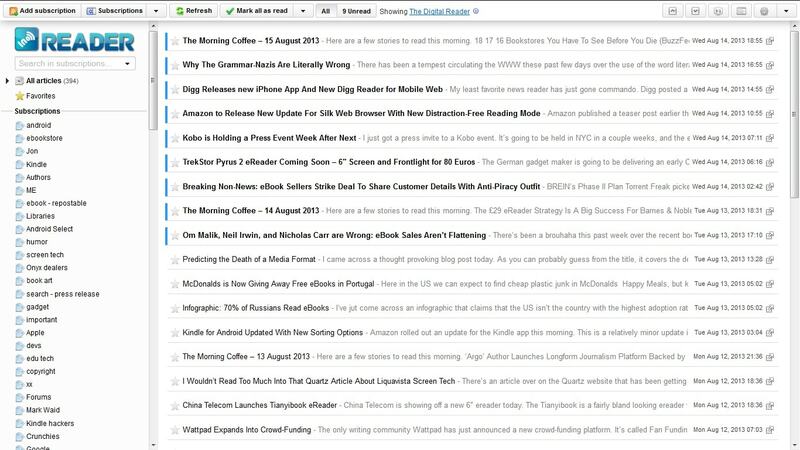 InoReader is a relatively obscure news reader that deserved to have been at the top of all the GR alternatives lists. It offers more customization options, including display, profile, and behavior, than pretty much any other news reader. The service was initially launched in April. It's free, and it offers a browser view, a mobile browser-friendly layout, and an Android app. There's also an API, but that's more for app developers than for users. BTW, there is an option for hiding folders and feeds that don't have new content; I just hadn't found it yet when I took that screen shot. And as you can see in the menu bar along the top you also have the option of showing all articles or just the unread blog posts. 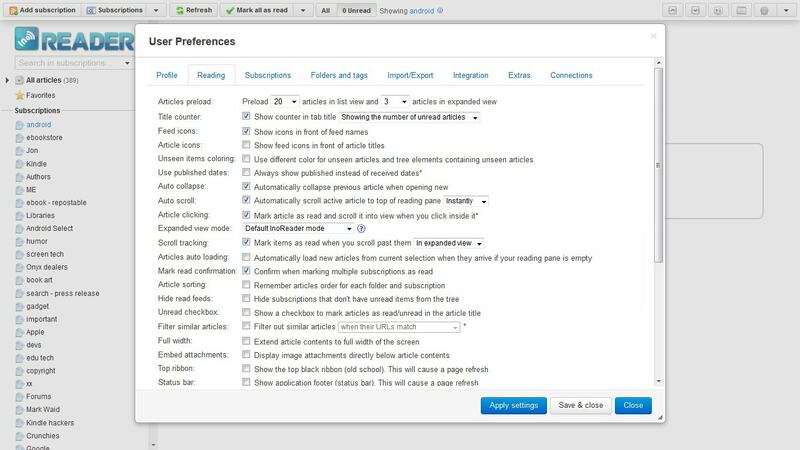 As you can also see in the screen shot, InoReader also offers the option of importing and exporting your subscriptions. The import is slow but it works. There are also tabs for managing your subscriptions and folders/tags, which is nice. While many news readers offer similar management options they're not as easy to use. In terms of extras, InoReader offers Pocket and Instapaper integration as well as a couple Chrome bookmarklets (one makes it easier to subscribe while the other notifies you of new unread posts). This service also offers search (it works, too) and it will automatically update with new content for you to peruse (not all news readers do that). Here's what it looks like when you read an article in InoReader. This is not a distraction-free reading mode, but it's readable, not too wide, and the images are aligned correctly. It's definitely usable. One thing you can't see in the screenshot is the footer of the reading window. That offers a keep unread button as well as sharing options (email, FB, Twitter, and many more). This service is pretty great, but unfortunately InoReader is also not terribly stable (for me). I have managed to crash it twice, and I even took down Firefox at the same time. TBF, my issues probably had more to do with the 2100 feeds I follow and not InoReader. Update: Firefox crashed a couple more times today after I stopped using InoReader. Clearly there is an unrelated issue. In spite of the issues I have had, I still plan to keep InoReader on my shortlist of alternatives. The positives far outweigh the negatives. Been using InoReader for several weeks (with 400+ feeds). Very pleased with the customization options, speed, etc. Hasn’t crashed my PC yet, though my android phone doesn’t like it. Actually, I think the Firefox issue was unrelated. I just signed up for and am really liking MnmlRdr (https://mnmlrdr.com/). It works really great on my Android phone and my iPad. Edit: Funny name, but there’s no way to try it for free before paying. I’ll pass. You can contact the owner. He was giving out free previews. I tried Arego RSS on android, its been fetching great news so far.